Have a day of magic on the 26th (Fri) at Walt Disney World Resort. Pack the 27th (Sat) with family-friendly diversions at Universal Orlando Resort. Next up on the itinerary: laugh and play at Happily Ever After Fireworks and make an unforgettable trip to Disney's Hollywood Studios. To find other places to visit, where to stay, reviews, and other tourist information, read our Orlando day trip planning app . Miami to Orlando is an approximately 4-hour car ride. You can also take a bus; or take a train. Expect little chillier evenings in Orlando when traveling from Miami in April, with lows around 65°F. Finish your sightseeing early on the 27th (Sat) to allow enough time to travel to Vicksburg. Vicksburg is the only city and county seat of Warren County, Mississippi, United States. Start off your visit on the 28th (Sun): take in the history at Vicksburg National Military Park, take a memorable drive along Vicksburg Campaign Trail, and then get engrossed in the history at U.S.S. Cairo Museum. For where to stay, reviews, traveler tips, and other tourist information, read our Vicksburg route builder tool . You can fly from Orlando to Vicksburg in 5 hours. Other options are to drive; or take a bus. The time zone difference when traveling from Orlando to Vicksburg is minus 1 hour. Prepare for slightly colder weather when traveling from Orlando in April: high temperatures in Vicksburg hover around 77°F and lows are around 56°F. Finish up your sightseeing early on the 28th (Sun) so you can go by car to Natchez. Natchez is the county seat and only city of Adams County, Mississippi, United States. Start off your visit on the 29th (Mon): admire the masterpieces at Stratton Chapel Gallery, then take in nature's colorful creations at Natchez Garden Club, then take in the architecture and atmosphere at St. Mary Basilica, and finally stroll through Bluff Park. To see other places to visit, more things to do, ratings, and other tourist information, read Natchez travel route planning site . Traveling by car from Vicksburg to Natchez takes 2 hours. In April, plan for daily highs up to 76°F, and evening lows to 55°F. Wrap up your sightseeing on the 29th (Mon) early enough to travel to Austin. Kick off your visit on the 30th (Tue): ponder the world of politics at Texas State Capitol, then admire the natural beauty at Lady Bird Johnson Wildflower Center, and then stroll through Lady Bird Lake Hike-and-Bike Trail. On the 1st (Wed), you'll have a packed day of sightseeing: take an in-depth tour of Bullock Texas State History Museum, admire the natural beauty at Zilker Metropolitan Park, then test your team's savvy at The Escape Game Austin, and finally admire the landmark architecture of The Driskill. To see maps, traveler tips, ratings, and tourist information, use the Austin visit planner. Traveling by combination of car and flight from Natchez to Austin takes 5 hours. Alternatively, you can drive; or do a combination of car and bus. In April, daytime highs in Austin are 80°F, while nighttime lows are 59°F. Finish your sightseeing early on the 1st (Wed) so you can drive to San Antonio. Kick off your visit on the 2nd (Thu): contemplate the long history of Mission San Jose, then take in nature's colorful creations at San Antonio Botanical Garden, then steep yourself in history at The Alamo, and finally stroll through The San Antonio River Walk. Get ready for a full day of sightseeing on the next day: pause for some serene contemplation at San Fernando De Bexar Cathedral, then appreciate the extensive heritage of King William Historic District, then admire the architecture and history at Mission Espada, and finally admire the masterpieces at San Antonio Museum of Art. To find photos, other places to visit, maps, and more tourist information, use the San Antonio holiday maker website . Drive from Austin to San Antonio in 1.5 hours. Alternatively, you can take a bus; or take a train. In May, daily temperatures in San Antonio can reach 87°F, while at night they dip to 66°F. Wrap up your sightseeing on the 3rd (Fri) to allow time to travel to New Orleans. 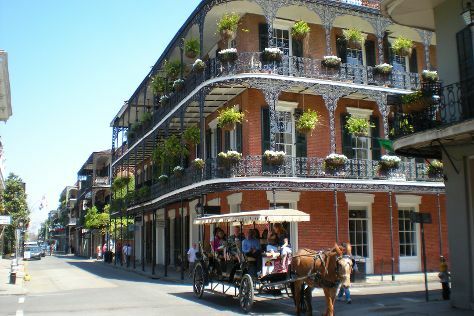 New Orleans is known for historic sites, museums, nightlife, shopping, and parks. Your plan includes some of its best attractions: see the interesting displays at The National WWII Museum, tour the pleasant surroundings at New Orleans City Park, make a trip to French Quarter, and admire the striking features of St. Louis Cathedral. For where to stay, other places to visit, traveler tips, and tourist information, read our New Orleans planner . Fly from San Antonio to New Orleans in 4.5 hours. Alternatively, you can do a combination of bus and flight; or drive. While traveling from San Antonio, expect slightly colder days and about the same nights in New Orleans, ranging from highs of 70°F to lows of 70°F. Wrap up your sightseeing on the 6th (Mon) early enough to travel to Key West. Key West is known for wildlife, adventure, museums, nightlife, and nature. Your plan includes some of its best attractions: see the interesting displays at The Ernest Hemingway Home and Museum, make a trip to Duval Street, take a leisurely stroll along Mallory Square, and identify plant and animal life at Key West Butterfly & Nature Conservatory. To find where to stay, photos, more things to do, and other tourist information, read Key West trip itinerary builder app . Fly from New Orleans to Key West in 6.5 hours. Alternatively, you can do a combination of flight and shuttle; or drive. The time zone changes from Central Standard Time (CST) to Eastern Standard Time (EST), which is usually a 1 hour difference. Traveling from New Orleans in May, things will get somewhat warmer in Key West: highs are around 85°F and lows about 77°F. Wrap up your sightseeing on the 9th (Thu) early enough to travel back home.